I’m going to drop the “in my bag” portion of title on this, my series of semi-regular updates. And there are a lot of updates this week. The first half of this year, I was making a big effort to go through my piles of untested cameras and take them out for a spin. The ultimate goal of these tests (beyond self-education) is to write reviews for the site. Currently I have notes and photos for a dozen or more cameras I intend to review. Because I have a stockpile of content to ready and publish, and because I’ve been focused much more intently on my Big Mysterious Project of Secret Mystery, I haven’t been taking out new cameras every week or two and have had to stretch the definition of “in my bag” more than once. The purpose of this blog is to be an informational resource. I intend it to be composed of, in about equal parts, four things: photography resource information, camera and accessory reviews, my work (in the form of posts centered around a place, event or theme), and updates on my personal photographic journey. This column satisfies the latter, but I no longer feel it needs to revolve so specifically around a nebulous “camera of the week” idea. Don’t worry, there will still be plenty of updates about that kind of thing. Several weeks (almost a month) have passed since I published the last This Week column, and the delay has been a result of several personal factors, among them delays and complications in the resolution of matters concerning the two times Kate has been a victim of traffic accidents this summer, and my anti-negativity campaign. After replacing Kate’s wrecked car, she was promptly hit again and now fencing with Allstate over the value of the car and her loss-of-use, and their sketchy tactics. As for the negativity, in examining my life and the things that were impacting my ability to work and progress, I found that I was exposing myself daily to more negative people and messages than I think is really healthy for me. I’ve taken steps to address this, and things seem to be improving. I’ve mentioned before that I’ve been involved in a project with two other Western photographers, and as that continues to gel, we seem to be slowly letting out some occasional details. I think we are all three quite excited by the potential we feel this work has — I know I am! So, while I’m not going to give away much, I will be posting some occasionally Sneak Peak updates featuring outtakes from the stockpile of photographs I’ve been amassing for this project. 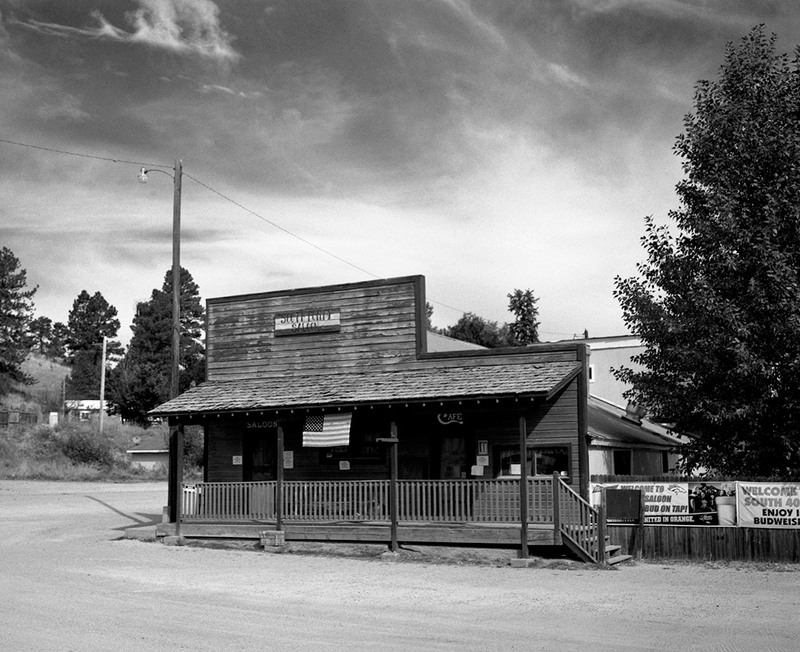 I made this image of the South Forty Saloon in Elbert, Colo., with the Pentax 6×7 and 75mm f/4.5 Super-Multi-Coated Takumar lens, using an R2 (Wratten 25) filter. It was around 8 a.m., the sun was still fairly low in the eastern sky, and the misty morning hadn’t quite cleared. The red darkened the sky and really brought out the contrast in the wooden siding, where scraps of red paint cling to the edges. I used Ilford Pan F Plus film and developed it as I described last week. Elbert is a farming and ranching town about an hour southeast of Denver on the Palmer Divide — a ridge that separates the South Platte and Arkansas rivers’ watersheds. Founded in 1860, Elbert is older than many other farm communities on Colorado’s Eastern Plains. It thrived as a stop on the Denver and Rio Grande railroad in the 1880s until a flood in 1935 wiped out 65 of the town’s buildings. The remaining buildings seem to end abruptly about half a block from the paved road, almost as if the town were cut in half — because it was. The current paved county road and what’s left of the town are all on high ground, east of the creek that has flooded repeatedly since the town’s founding. The railroad grade that once connected Denver to Pueblo can still be seen throughout Elbert County, but the tracks were pulled up not long after the flood and Elbert has never really recovered in any meaningful way. Without its relative proximity to Denver and Colorado Springs, and the nearby Peaceful Valley Boy Scout camp, the town likely would be but another memory. Most recent additions to my photographic toolbox have been filters. I’m still a complete novice when it comes to filters — though maybe not as much as when it comes to artificial light — but I’m learning and hoping to share that part of my journey here as I do all the other bits. It’s no secret that I visit Englewood Camera regularly — probably more than is healthy for my back or my pocketbook — and their piles of miscellany seldom disappoint. Lately I’ve taken to poking around in their bins of used filters for anything I might want to experiment with. 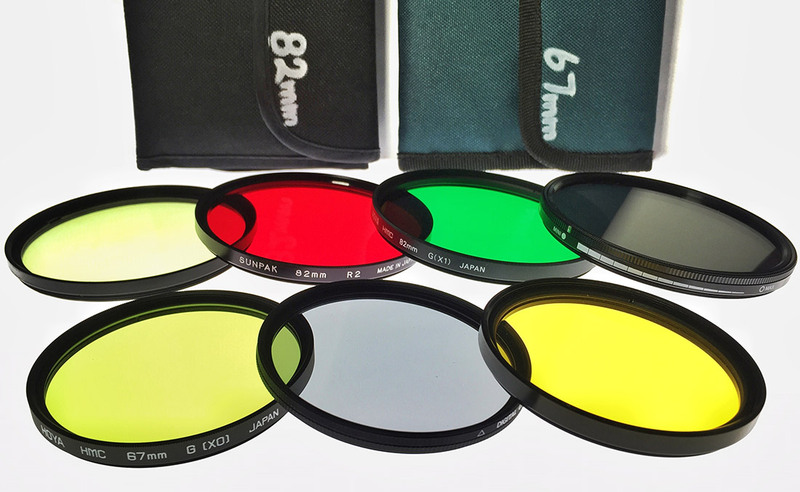 Since I’ve been using the Pentax 6×7 almost exclusively, this has meant that their supply of used 82mm filters is now my supply of used 82mm filters, and that I’ve found a few 67mm filters, too. I also found a couple of padded filter wallets in the bargain bin at Englewood Camera last week to keep these (and up to 5 more!) filters in in my camera bag. I’ve labelled them and made room. I suppose it’s worth mentioning that the Pentax 6×7 kit is now housed in a Domke F-1X “Little Bit Bigger” bag in black canvas, which I got from KEH.com for a steal. Ultimately I might want to invest in a Cokin system or something similar if I find that filters add that much to my arsenal, but for the time being threaded filters will do for testing. I do expect that they will remain a regular part of my oeuvre — they have been essential tools for many of history’s great photographers. So far the results are encouraging, as you can see above.